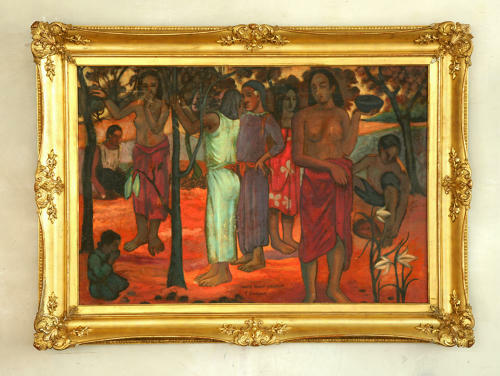 This accurate copy of Nave Nave Mahana (Tahitian: Delicious day)by Paul Gauguin was done by the famous studio of Miguel Canals in the early 1950s. Canals reproductions are finely executed copies of the same size , media and in elaborate gilt frames. The original is kept in the Museum of Fine Arts of Lyon. The painting became part of the collections of the Lyon Museum in 1913. In 1891, Gauguin sailed to Polynesia to escape European civilization and "everything that is artificial and conventional". His works of that period are full of quasi-religious symbolism and an exoticized view of the inhabitants of Polynesia. In 1896, he painted Nave Nave Mahana in Tahiti after he came back from a short stay in France. A group of mysterious young women seem to be gathering fruit from the branches of plants. Their feet are solidly anchored on the red ground. Behind them, we can see a yellow sky. Frozen, distant, silent, with eyes cast down and solemn faces, the figures are perhaps a revealing indication of the artist's isolation and ill health at the time of painting.